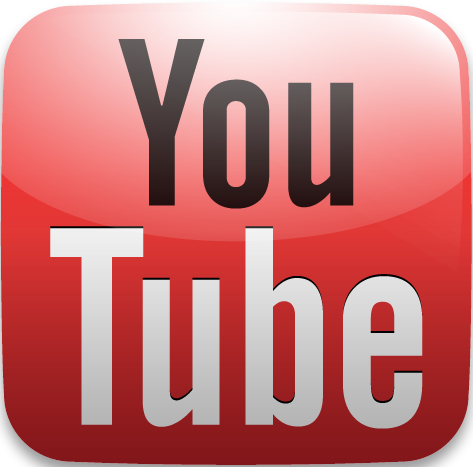 Under Secretary, Stakeholders View Idaho Site’s Innovative Cleanup Projects; Demolition Begins on Oak Ridge’s TSCA Incinerator; and Much More! DOE Under Secretary for Science Paul Dabbar and others watch a Fluor Idaho employee don personal protective equipment prior to entering an Advanced Mixed Waste Treatment Project boxline to perform a criticality cleanout. 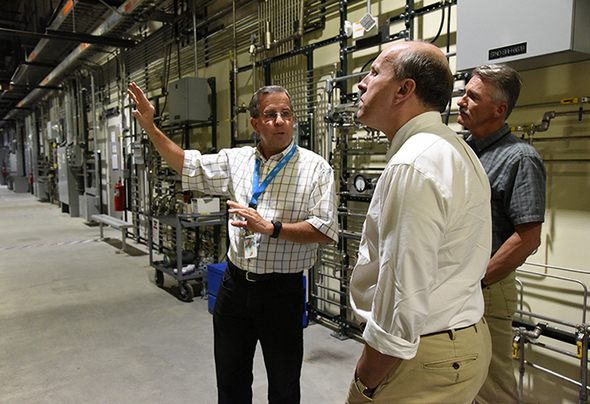 IDAHO FALLS, Idaho – DOE Under Secretary for Science Paul Dabbar visited the Idaho National Laboratory Site last week, where he viewed one-of-a-kind equipment and processes used to advance cleanup by EM and cleanup contractor Fluor Idaho. 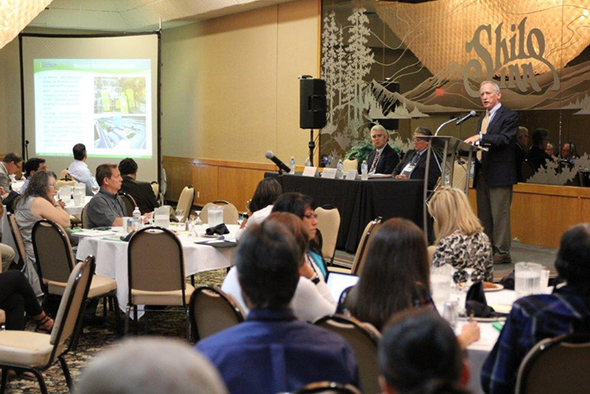 Dabbar’s tour took place in conjunction with the joint annual meeting of the State and Tribal Government Working Group (STGWG) and the National Governors Association's (NGA) Federal Facilities Task Force (FFTF) at which he was the featured speaker. At the DOE-Idaho site, Dabbar visited the Advanced Mixed Waste Treatment Project (AMWTP), Radioactive Waste Management Complex (RWMC), and Integrated Waste Treatment Unit (IWTU). Dabbar looked on as a Fluor Idaho employee donned a “bubble suit,” complete with supplied air, as he prepared to clean out a boxline to ensure no risk of a criticality as waste was sized and repackaged for supercompaction at the AMWTP. At the joint meeting, Dabbar spoke about efforts to ensure safe, steady progress at EM sites, position assets for future beneficial use, and prepare the next generation workforce. Fluor-Idaho Integrated Waste Treatment Unit (IWTU) Operations Manager Craig Olson, left, and DOE IWTU Project Manager Kevin O’Neill, behind, brief DOE Under Secretary for Science Paul Dabbar at IWTU. 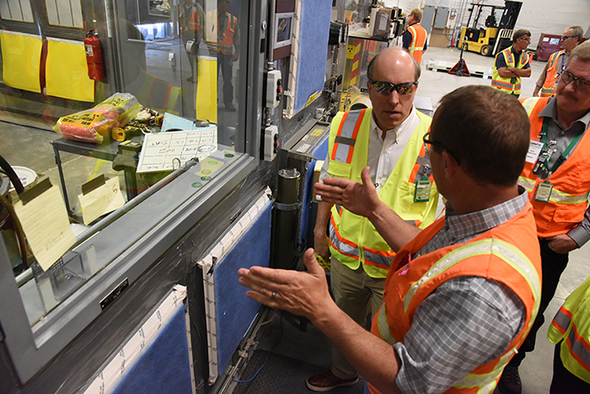 Fluor-Idaho Accelerated Retrieval Project (ARP) Operations Manager Jason Chapple, left, briefs DOE Under Secretary for Science Paul Dabbar at the ARP VII, where crews size-reduce and decontaminate large items from the Advanced Mixed Waste Treatment Project. At EM sites, workers have broken ground on a new ventilation system at the Waste Isolation Pilot Plant (WIPP) in New Mexico to increase shipments to the facility, completed the final phase of building demolition for Buildings H2 and G2 at the Separations Process Research Unit, begun moving radioactive sludge away from the Columbia River at Hanford, and are on pace to complete cleanup at a Tonopah Test Range site in Nevada. Dabbar highlighted work to solve technical challenges by leveraging the capabilities of the national laboratories, remove regulatory roadblocks that stand in the way of progress, and bring urgency to the decision-making process. “This will enable EM to maximize the most promising opportunities to enhance safety, shorten schedules, increase transparency, and reduce costs, culminating in the best results for cleanup communities and the best value for American taxpayers,” Dabbar said. Dabbar also discussed the Department’s ongoing workforce needs and efforts to enable more young people to pursue science, technology, engineering, and math (STEM)-based education and careers. He expressed appreciation for the DOE Tribal Working Groups’ focus on STEM, reiterating Energy Secretary Rick Perry’s commitment to enhancing STEM opportunities in Indian Country. Participants in the joint annual meeting also were briefed on EM activities by Mark Gilbertson, Associate Principal Deputy Assistant Secretary for Regulatory and Policy Affairs, and Ken Picha, acting Associate Principal Deputy Assistant Secretary for Field Operations. Mark Gilbertson, EM Associate Principal Deputy Assistant Secretary for Regulatory and Policy Affairs, addresses the State and Tribal Government Working Group and National Governors Association's Federal Facilities Task Force at the joint annual meeting. 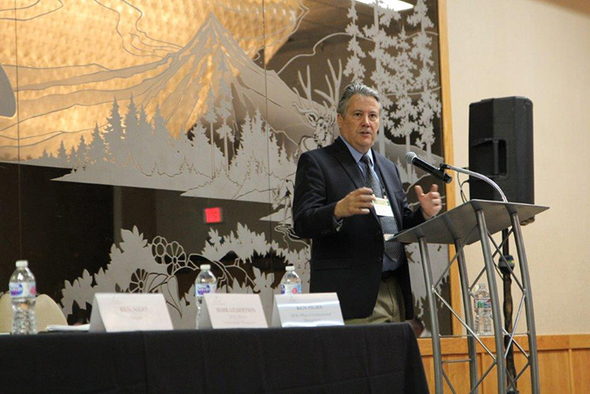 Ken Picha, EM acting Associate Principal Deputy Assistant Secretary for Field Operations, speaks at the State and Tribal Government Working Group and National Governors Association's Federal Facilities Task Force joint annual meeting. State and Tribal Government Working Group and National Governors Association Federal Facilities Task Force members view operations in the Transuranic Storage Area Retrieval Enclosure during their tour. STGWG formed in 1989 to bring together representatives from states and Indian tribes that host or are otherwise affected by DOE sites or facilities associated with the production and cleanup of the nuclear weapons complex. Two members of the Shoshone-Bannock Tribes gave a cultural briefing to STGWG during their visit at the nearby Fort Hall Indian Reservation. The NGA FFTF consists of governor-appointed policy and technical representatives from 13 states that host DOE facilities with a purpose of assisting DOE in improving coordination of its major program decisions with state regulators. In a separate site tour, more than 50 members of STGWG and NGA FFTF were briefed on EM cleanup projects at AMWTP, RWMC, Idaho Nuclear Technology and Engineering Center (INTEC), and IWTU. 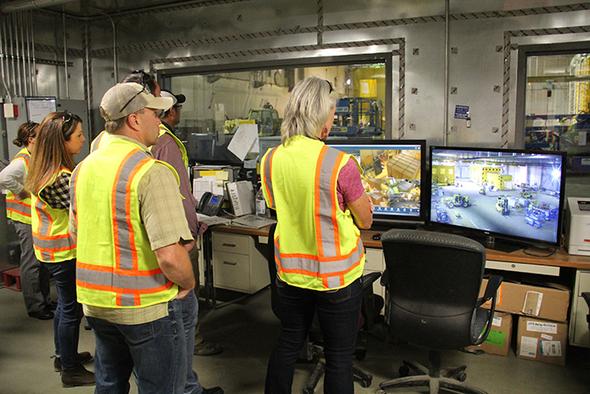 At AMWTP, the group viewed robotic arms size-reduce transuranic waste and prepare the material for the supercompactor, which reduces 55-gallon waste drums to 4-inch-tall pucks for disposal at WIPP. STGWG and NGA FFTF members were also among the site’s first tour groups to see completed modifications to INTEC’s CPP-659 hot cell. 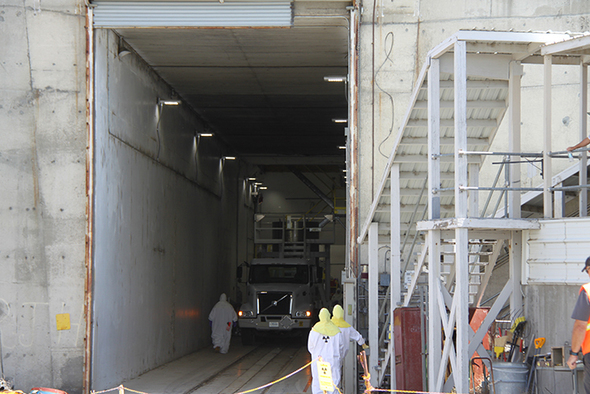 Operators use the hot cell to repackage remote-handled transuranic waste. The hot cells’ hatch covers were enlarged to accept larger waste containers. As a protective measure, a mechanism was fabricated to allow operators to open and close the hatch covers. 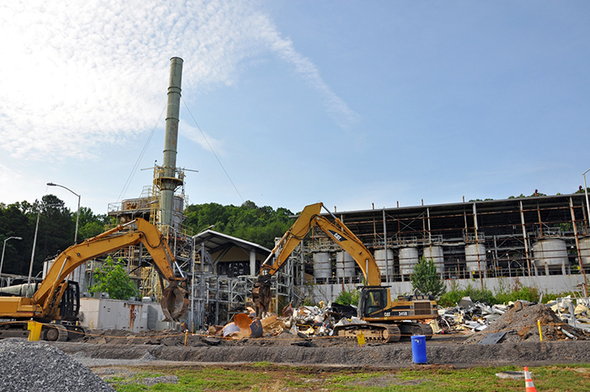 Initial demolition activities at Oak Ridge's TSCA Incinerator began recently. 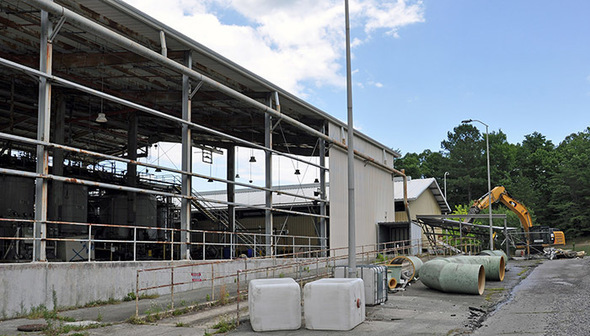 OAK RIDGE, Tenn. – Demolition of one of DOE’s most unique facilities is underway at the East Tennessee Technology Park (ETTP). The one-of-a-kind Toxic Substances Control Act (TSCA) Incinerator was named after a law Congress passed in 1976 that addresses the production, importation, use, and disposal of specific chemicals, including polychlorinated biphenyls (PCBs). The facility began operating in 1991. While other incinerators could burn radioactive and hazardous waste, only the TSCA Incinerator could burn hazardous, radioactive waste that contained PCBs. 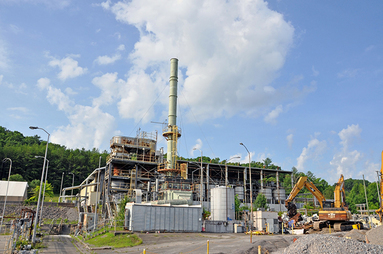 As the only U.S. facility permitted to incinerate those types of waste, the TSCA Incinerator was in high demand for nearly 20 years and accepted waste streams from DOE sites nationwide in addition to material from DOE’s Oak Ridge site. The TSCA Incinerator ceased operations in December 2009 after treating more than 35 million pounds of liquid and solid waste. In the years after, employees began cleaning the TSCA Incinerator to place it in safe shutdown. Demolition is underway on the TSCA Incinerator. 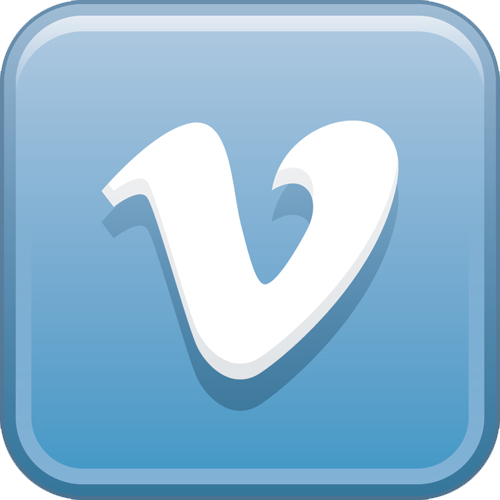 The facility treated more than 35 million pounds of waste during its 20 years of operations. In 2013, workers completed stabilization and closure activities required to achieve safe shutdown. All chemicals were removed from the facility, and components such as piping and pumps were triple-rinsed or removed. Additionally, OREM completed all the required Resource Conservation and Recovery Act closure actions, helping the site achieve its regulatory commitments. Workers decontaminated equipment and areas within the facility, and applied fixatives to ensure contaminants remain in place during the teardown. Demolition is expected to be completed this fall. The goal for OREM and its cleanup contractor URS | CH2M Oak Ridge is to transform the old government-owned uranium enrichment complex into a thriving privately owned industrial park. To date, EM has torn down more than 400 facilities and transferred more than 1,000 acres. AIKEN, S.C. – Centerra-SRS, which provides security at the Savannah River Site, earned an overall “excellent” performance rating for the most recent evaluation period, Oct. 1, 2017 to March 31, 2018. 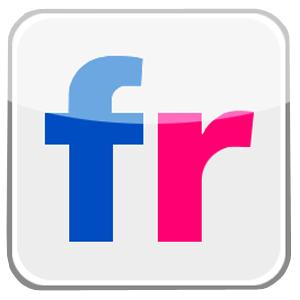 The award fee determination scorecard allows the company to receive $2,996,997, or 94.75 percent, of the total award fee available of $3,163,057 for the six-month period. Centerra-SRS personnel demonstrated an exceptional level of performance this period, meeting or exceeding most of the performance goals and objectives and supporting the site’s security posture at various SRS operating facilities, according to the scorecard. During this performance period, Centerra-SRS executed the SRS security mission effectively and competently, demonstrated most notably by the efficient and safe return to normal operations after a 55-day strike by Protective Force (PF) employees. This included a comprehensive, well-orchestrated return-to-duty recovery plan that coordinated fitness-for-duty training, physical fitness tests, weapons qualifications, and other training requirements required for more than 200 striking PF members to return to work. 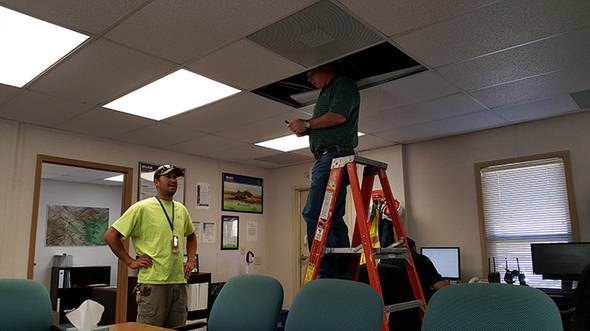 Centerra-SRS management and support personnel accomplished this monumental feat efficiently, resulting in a smooth return to normal operations with no impact to site security or operations. Effective emergency responses to numerous security and emergency situations were noted in the report, as was the contractor’s action to fill vacancies and new positions quickly. A significant improvement in safety statistics from the previous reporting period demonstrated the effectiveness of efforts to address an increase in recordable injuries in the previous period. View the Centerra-SRS fee determination scorecard here. The first sludge transport and storage container leaves 100-K on its way to T Plant for safe storage away from the Columbia River. 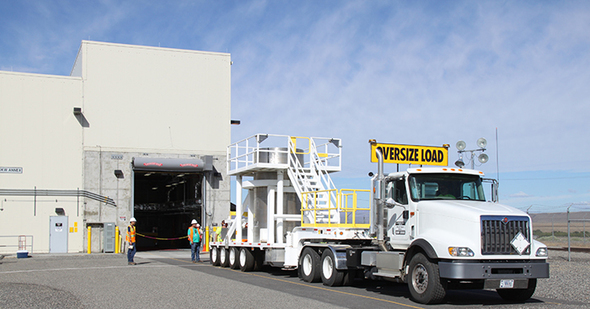 RICHLAND, Wash. – EM’s Richland Operations Office (RL) and its contractor CH2M HILL Plateau Remediation Company (CHPRC) safely and successfully shipped the first load of highly radioactive sludge away from the Columbia River to safer storage on the Hanford Site. The first shipment of sludge occurred late last month, about two weeks after crews began transferring the sludge from the 105-K West Reactor Basin, near the Columbia River, into large casks specially designed for transport to and storage at T Plant, about 10 miles away from the river. “Moving the sludge away from the Columbia River is very important from an environmental standpoint. We’ve completed cleanup of most of the areas along the river, so removing the sludge will allow us to remove the basin and complete cleanup of the 100-K Area,” said Mark French, director of RL’s River Corridor division. About 15 minutes after leaving 100-K, the first sludge transport and storage container arrives at T Plant. Crews at T Plant guide the truck with the container of sludge into position inside the former processing facility. T Plant is a former plutonium-processing canyon at the center of the site where crews recently added secondary containment basins and leak detectors to keep the sludge storage containers in a safe configuration. Over the next year, there will be about two dozen sludge shipments to T Plant as crews retrieve the 35 cubic yards of sludge from the reactor basin, allowing for the eventual decommissioning of the 105-K West Reactor. The sludge will remain at T Plant until final disposition decisions are made. “Filling the first container of sludge and shipping it to T Plant without any significant issues represents years of engineering, design, testing, development, fabrication, construction and startup readiness,” said Ray Geimer, vice president for CHPRC’s sludge removal project. Sludge removal is expected to be complete in 2019. 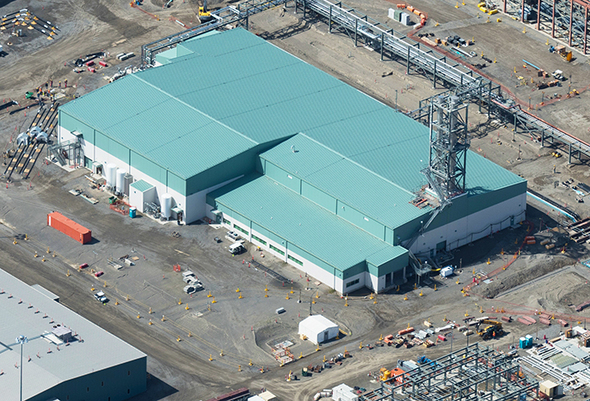 The Washington State Department of Ecology’s approval of the Hanford Waste Treatment and Immobilization Plant’s (WTP) Analytical Laboratory operating permit marks the first major WTP facility to complete all phases of the state’s mandated permit lifecycle. 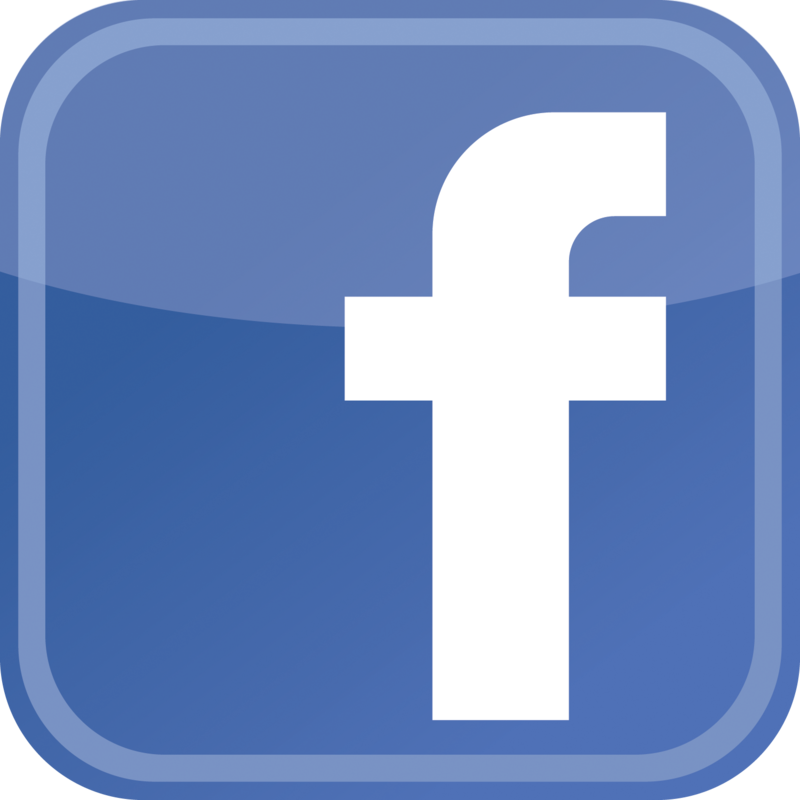 RICHLAND, Wash. – The Washington State Department of Ecology has approved an operating permit for the Analytical Laboratory at Hanford’s Waste Treatment and Immobilization Plant (WTP) Project. The laboratory supports EM’s plans to begin treating tank waste through its Direct Feed Low-Activity Waste (DFLAW) vitrification approach. Approval of the permit marks the first major WTP facility to complete all phases of the state’s mandated permit lifecycle — from initial design, through groundbreaking and construction, and now to an approved operating permit issued. The key function of the laboratory is to confirm the glass produced by the WTP Low-Activity Waste (LAW) Facility meets regulatory requirements. The laboratory will analyze approximately 3,000 WTP process samples each year. Samples of incoming low-activity tank waste will be analyzed to confirm the correct glass-former “recipe” to produce a consistent, high-quality glass form. 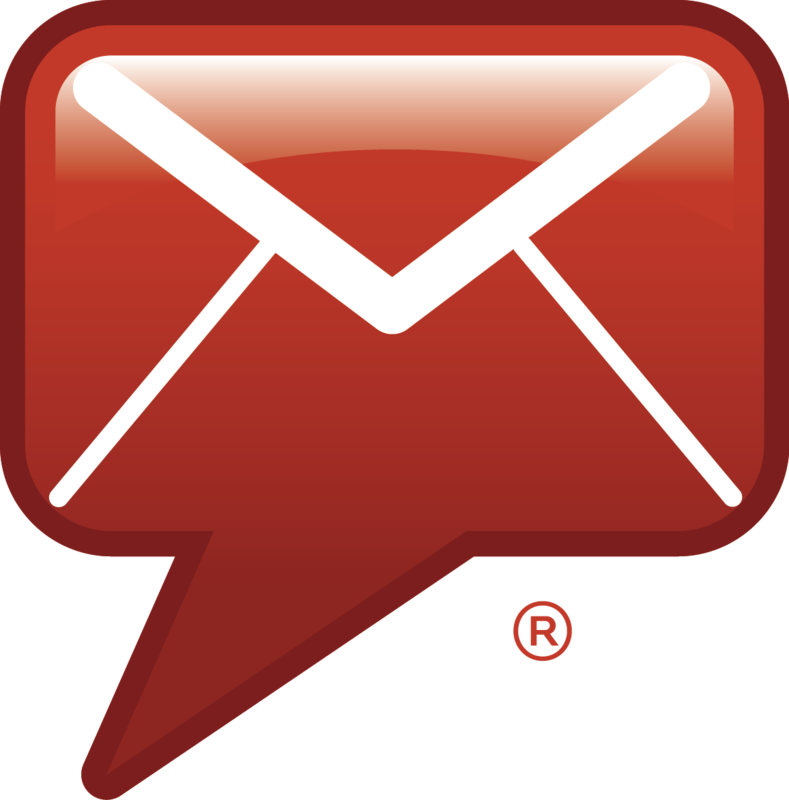 The DFLAW approach is expected to enable treatment of low-activity waste to begin in advance of a court-ordered milestone date of 2023. This approach will increase available double-shell tank space and provide valuable lessons learned to aid startup and commissioning of other portions of the WTP. Excavation for Saltstone Disposal Unit (SDU) 7 is underway. In the background is recently completed SDU 6, the first mega-volume SDU built at the Savannah River Site. Savannah River Remediation, the SRS liquid waste contractor, leads the construction and management efforts of the SDUs. 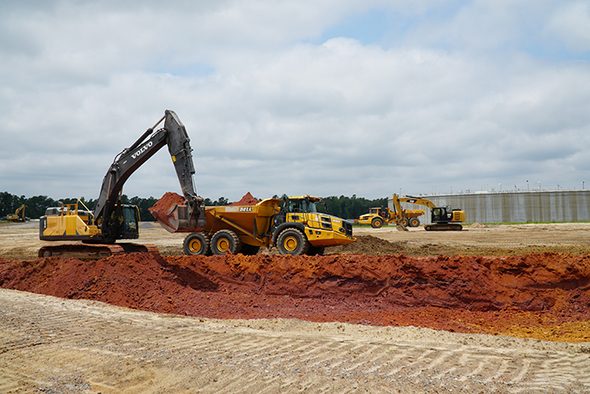 AIKEN, S.C. – Excavation is underway to prepare the foundation for EM's second 32-million-gallon liquid waste disposal unit at the Savannah River Site (SRS). Saltstone Disposal Unit (SDU) 7 is the second of seven mega-volume disposal units planned at SRS. Savannah River Remediation (SRR), the SRS liquid waste contractor, is building on the successful design and lessons learned from construction of SDU 6, which was completed last year 16 months ahead of schedule and $25 million under budget. SDUs are permanent disposal units for low-activity waste grout produced from solidification of decontaminated non-hazardous salt waste. EM approved the concept of replicating the mega-volume design for all remaining SDUs at SRS, a storage design that has been proven effective in the commercial sector. To prepare the SDU 7 foundation, a local small business subcontractor is using heavy machinery to dig approximately 20 feet below grade. More than 170,000 cubic yards of soil will be moved for placement of concrete mud mats, which will serve as the foundation for the concrete structural base slab and protect the leakage detection system, which is comprised of a specially engineered geosynthetic clay liner and a high-density plastic liner, similar to commercial landfill applications. Excavation is projected to continue through the summer and the concrete mud mats and leakage detection system will be in place by the end of the year to support construction of the mega-volume disposal unit beginning in January 2019. SDU 7 will stand about four stories tall and extend beyond the size of a football field when complete. It will take about three years for SDU 7 to be operational. The seven larger units will result in more than $500 million in cost savings over the life of the low-level saltstone waste storage program because less infrastructure and materials are required to design and build the larger SDUs. The mega-volume SDUs are more than 10 times larger than the smaller units on site and will accommodate the larger stream of decontaminated salt solution from the Salt Waste Processing Facility when operational. Continuous improvement and innovation are key principles for EM, and the new-style SDU is a prime example of applying these principles to the mission, DOE-Savannah River Manager Mike Budney said. “The use of larger disposal units, like SDU 7, proves DOE’s and SRS’s commitment to continue to be good stewards of taxpayers’ money in that we always pursue the latest, most cost-efficient technologies to assist us in safely performing our mission of dispositioning the Cold War-era liquid waste,” Budney said. The SDUs at SRS are built to protect people and the environment for generations to come, SRR President and Project Manager Tom Foster said. “SDU 7 and its sister units allow us to manage the grout for the long-term, providing a safe destination for the low-level waste and reducing the risk to the surrounding communities and environment,” Foster said. Left to right: Pacific Office Solutions employee Amy Blasdel, Julie Valdez, the company’s owner, and Charlie Smith, director of DOE’s Office of Small and Disadvantaged Business Utilization. 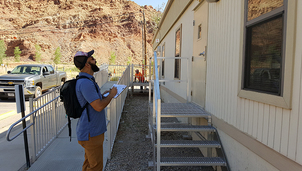 MOAB, Utah – An energy consulting firm recently visited the Moab Uranium Mill Tailings Remedial Action Project to identify ways the site could conserve energy. The visit was part of a local program sponsored by the City of Moab that aims to reduce energy costs while helping the environment. The team examined equipment such as lighting, air conditioning units, and water pumps. The firm will ultimately present a report outlining potential energy savings, which will be considered by site staff members for implementation. The Moab Project is relocating mill tailings from a former mill site in Moab to an engineered disposal cell near Crescent Junction, Utah. Volpentest Hazardous Materials Management and Emergency Response Federal Training Center’s Emergency Support Function team, left to right: Bill Edwards, Brad Jackson, Bill Eaton, Gary Karnofski, Nicole Zawadzki, Joe Cheevers, Amanda Mings, Steve Gunnink, and Deborah Croskrey. RICHLAND, Wash. – With hurricane season underway, emergency crews around the world are ready to respond should a storm strike. 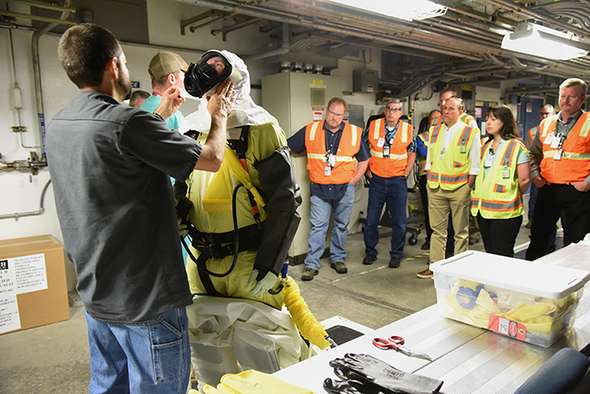 As an active member of Federal Emergency Management Agency (FEMA) disaster recovery response, the team at the Hanford Site’s Volpentest Hazardous Materials Management and Emergency Response (HAMMER) Federal Training Center is gearing up to support recovery if needed. Last year, HAMMER staff worked more than 120 consecutive days supporting areas affected by hurricanes Harvey, Irma, and Maria, and even in California for those affected by wildfires last year. 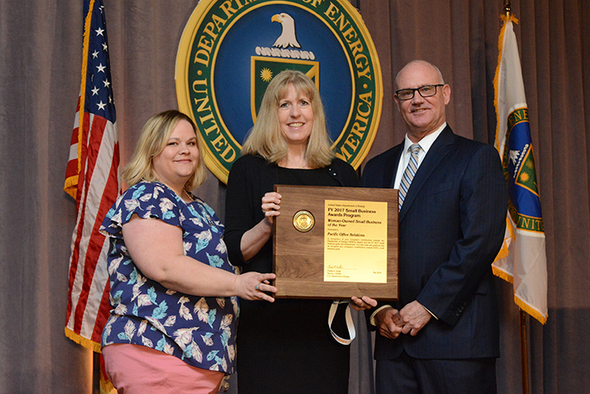 HAMMER has been part of the DOE Emergency Support Function energy response team since 2003 and plays a critical role in hurricane disaster recovery efforts. The team focuses on restoring damaged energy systems and components in affected areas. 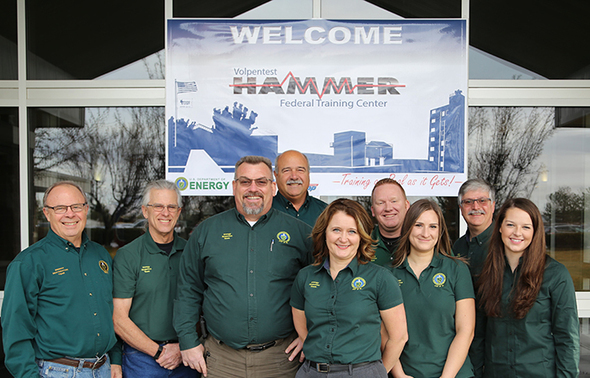 “The staff at HAMMER has been an amazing resource, and their contribution during these critical times is a credit to their hard work and dedication,” EM Richland Operations Office HAMMER Program Manager Jill Conrad said. DOE’s Infrastructure Security and Energy Restoration division leads the team and deploys a group of highly skilled energy experts to the FEMA response centers to help with disaster relief efforts. When disaster strikes, HAMMER responds, deploying team members to affected areas and supporting logistical efforts with reporting, action-tracking, and financial support for response efforts. 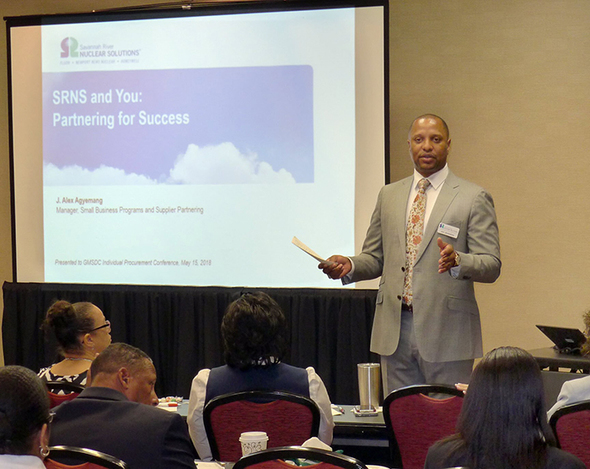 “HAMMER is proud to be part of preparing for and responding to energy emergencies,” said Nicole Zawadzki, with HAMMER Emergency Services Training & Programs. To prepare for the hurricane season, HAMMER recently participated in several preparedness exercises, including the recent Clear Path VI, DOE’s flagship annual emergency response exercise. 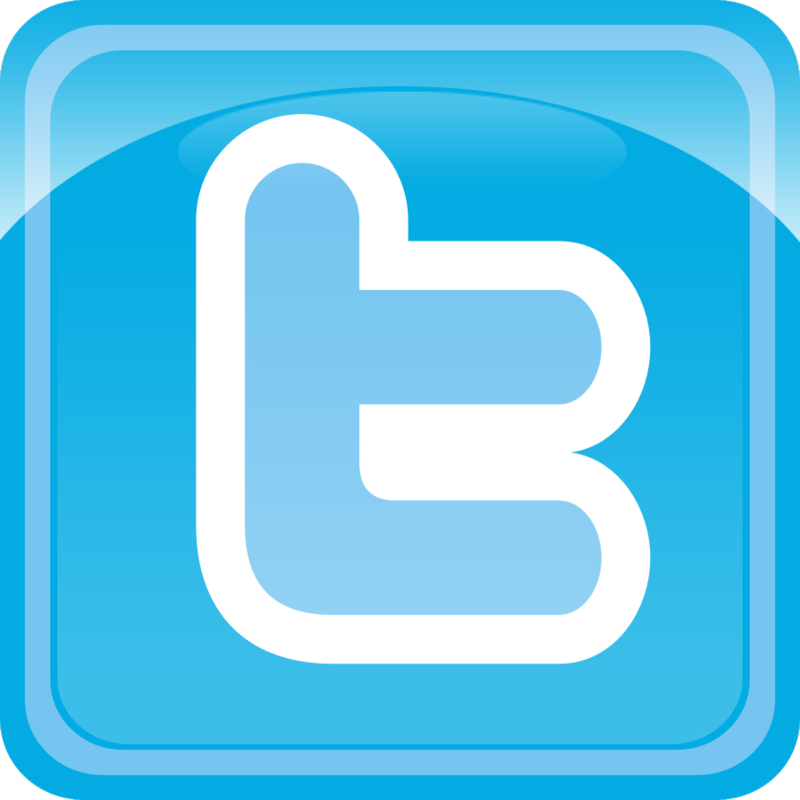 Objectives included examining response processes and challenges, and reinforcing relationships across the energy sector. In May, HAMMER also participated in the National Level Exercise, which brought together more than 12,000 individuals across the country to examine the ability to protect against, respond to, and recover from a major Mid-Atlantic hurricane.